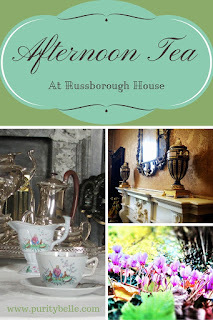 I've written before about Russborough House - here's my Picnic at Russborough House post from earlier this year. It's a beautiful place and I love to visit any time but I thought that Autumn would be particularly lovely and I was very happy to see an offer from Pigsback pop up in my inbox :) The offer included a tour of the house which we had never seen, and afternoon tea. As afternoon tea is possibly my favourite thing ever, I wasn't going to pass up on this! We had booked in advance and arrived just a few minutes late so we joined a tour straight away. The house is amazing, so beautiful and has such a fascinating history. The Beit family were owners of the house and loved Ireland. The story of their lives was gripping from the start. Alfred Beit was an art collector, pilot and photographer amongst other things. He married Clementine Mitford in 1939 - she was first cousin to the renowned beauties, the Mitford sisters. Their lives were varied and included travel and much entertaining, for which they were celebrated. Not only that but they were involved in the local community and Sir Alfred was very instrumental from the start in the famous Wexford Opera Festival. Clementine and Alfred both loved art and Clementine served on the board of the National Gallery. The Beit Art collection, which was later donated to the state, included works by Vermeer and Velasquez. The house itself is Palladian in design and was built by Joseph Leeson and is a stunning example of an Irish Big House. Every room exhibits style and comfort, quality and craftsmanship. Here's a little glimpse.. I loved the stairs and the light and the second floor was equally beautiful although not so lavish and ornate.. There is so much more to see and downstairs there is a fascinating interactive exhibition area which gives an even greater insight into the lives of the Beits, including some of Alfred Beit's photographic work. The only quibble I had with the tour was that it was a little bit speedy - there was very little time to soak it in and look at things in more detail and it was pretty hard to take decent photos as I felt a little bit rushed. Apart from that it was great and I would do it again for sure. Next up was the tea - I was pretty starving at that point and launched straight into our lovely feast of sandwiches and little cakes. It was served in a back room with a proper table cloth and teacups. It was delicious although perhaps a greater variety of savoury food would have been nice. The little cakes were lovely and it was just the right amount of food for two. Afternoon tea really is a lovely treat! Outside as always, the views were stunning and we went for a walk to stretch our legs and work off some of the food. There were lots of people lighting tea-lights in jars as part of a candlelight walk which was to take place later. The little twinkling lights lent an air of magic to our walk, especially as the light faded. If you are looking for somewhere to visit one of these Autumn days, do consider Russborough, such a fabulous place. Such a lovely looking place to go. Definitely fab idea about going in the autumn. It looks like a charming place to visit, I too love the history of older homes and like to soak up the atmosphere when exploring and looking around. You should mention to them about giving just a little longer on the walk abouts, to enable for people to treasure the moments. Afternoon tea is one of my favourite things too, it just is a shame not to have it weekly, though then again it wouldn't be as special, but I love the scones on top of dainty sandwiches and little cakes just finish it off nicely. I love afternoon tea and what a fabulous place to have it! Beautiful photos. I'd love to have an afternoon tea in a place like this. What a stunning property! Love a bit of Mitford history... I read a book about them last year, absolutely fascinating!